It came up in the most natural, mundane way possible. Like any married couple, my husband and I were swapping the details of our day over dinner when, for whatever reason, the conversation shifted to my father – whom I've never met. My husband was leaning forward in his seat and suggesting, as if on a dare, that he could probably track down my bio dad within a matter of minutes. Right on cue, my breath hooked and the bottom of my stomach dropped out. Suddenly, I imagined myself as the reluctant star of some reality TV show. It wasn't that I'd never wondered about my father before. However, I had been careful to keep whatever curiosity I felt about him in check. The idea of finding him seemed next to impossible. But then, there had been no omniscient machine that made all the questions answerable at the tap of a fingertip. I was curious. But not curious enough, it seemed, to find the man who had essentially deserted my mother the moment he discovered that she was pregnant. She was 18. The relationship wasn't serious. So goes the cliché. After my birth, he continued to prove evasive and, even at her age, my mom had too much pride to beg or otherwise demand anything from my father except that he make himself a ghost. And so, a ghost he became: One who never paid a cent in child support. One who never sent so much as a card for any of my 40 birthdays. My father became a ghost whose name she dared not mention. Any kind of interest or curiosity in the ghost on my part was interpreted as a betrayal. Because I didn't want to wound my mother – who'd done the herculean job of raising me on her own – any more than she'd already been wounded, we never spoke of him. 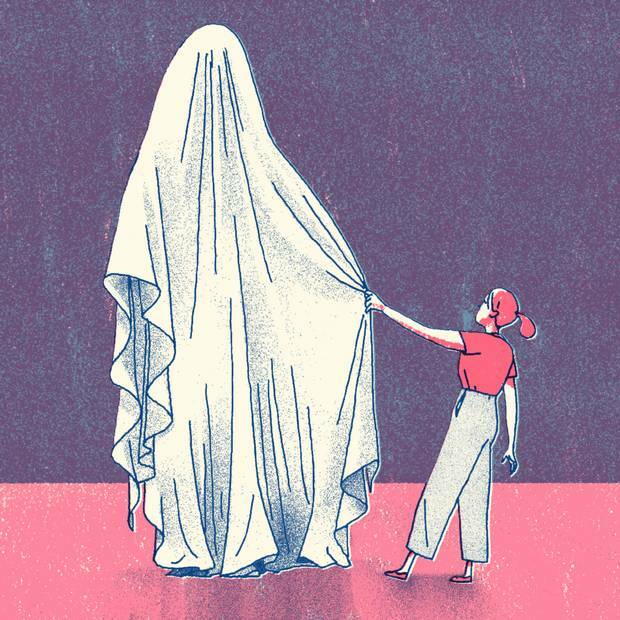 For years, I secretly wondered about the ghost in my DNA. What did he look like? Did we share any mannerisms? What were his greatest fears, his greatest accomplishments? Even the most banal details about him captivated me. After all, I was night to my mother's day. She was a sporty, caregiver type, contented with small-town living. Growing up, I had felt like an imposter, a stranger in my own family. Was my father passionate about the arts? Did he possess a wanderlust that lured him around the globe? Was he a depressive like me? Once I started a family of my own, rather than recede, the questions only multiplied in my mind. An only child, I naturally wondered about siblings. Had I been missing out on relationships with half-brothers and sisters? Wondering, however, was a safe haven. Sitting across from my husband in that restaurant, I felt dizzy, shaken at the prospect of finding my father. Over the years, I had patched together details, scattered crumbs from conversations with my mother. Now I had just enough information to satisfy if not me, then at least the world's most powerful search engine. "Here he is," my husband said, not two minutes later. Two minutes. That's all it took for Google to unearth the ghost. Two minutes to upend my world. "Do you want to see?" he asked, sensing my hesitation. Yes. No. Yes. No. Maybe. My husband reached across the table and handed me his phone. Surreal doesn't even begin to describe the moment I first laid eyes on my father. I'd always been told I was a dead-ringer for my mom, yet I now saw that I also bore an uncanny resemblance to him. My eyes were his eyes. Had we been in the same room, it would have been plain to see that we were related. That we are related. Bound by genetics and nothing more. He had made sure of that. Strangely, I never blamed him for his decision. He was young, after all, barely a man and unequipped (or unwilling) to take on a family – at least as unequipped to be a parent as I would have been at that age. Staying may have proved an even bigger mistake than letting us go. Now, Google had offered him to me on a silver platter. Along with his photo, the page listed his home address and his place of work. It was far too easy. What was stopping me from punching in his number and waiting to hear his voice? Nothing. Everything. What was stopping me from waltzing into his office unannounced one day? Would he recognize my eyes (his eyes)? And in a single glance, would the levee of the past come crashing over him? Would he feel regret or relief? Would he feel nothing at all? I couldn't stop staring at his picture. All those years he had been right under my nose, living and working in the same small town where I once lived. We had probably passed each other in the street. We must have visited the same stores, sat in the same cafés, the same movie aisles. And that's how it would remain, I decided at last, handing the phone back to my husband just as our food arrived. Strange. Strangers. Who you don't know can't hurt you. My father had made up his mind 40 years ago and never looked back. So why should I? Or maybe he had looked back. Late one night, on a whim, perhaps he asked and Google duly answered. Who knows, perhaps he had stared at my photo until the screen went dark. I'll never know either way. Maybe I'm not supposed to. Julie M Green lives in Toronto.